As the world's most widely-used intelligence test for children, the WISC-V is useful in diagnosing intellectual disabilities and specific learning disabilities, as well as in identifying giftedness. In this volume, sample reports demonstrate how WISC-V assessment results may be linked to interventions, accommodations, modifications, and compensatory strategies that facilitate positive outcomes for children. 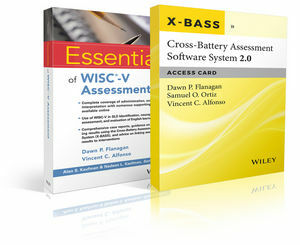 Essentials of WISC-V Assessment is the all-in-one practical resource for both students and practitioners. 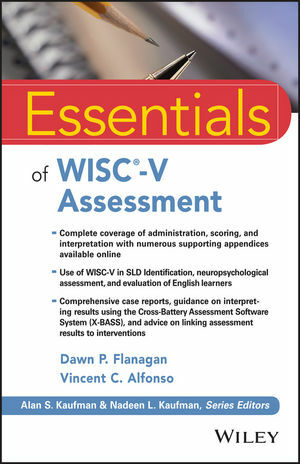 The book can be used on its own or with companion software (purchased separately) that provides a user-friendly tool for producing psychometrically and theoretically defensible interpretations of WISC-V performance, and may be used to develop interventions based on each child's strengths and weaknesses. Dawn P. Flanagan, PhD, is Professor of Psychology at St. John’s University and Clinical Assistant Professor of Psychology at Yale Child Study Center, Yale University School of Medicine. She serves as an expert witness, learning disabilities consultant, and psychoeducational test/measurement consultant and trainer for national and international organizations. Dr. Flanagan is an author of numerous publications and best known for her development of the Cross-Battery Assessment approach and the development of an operational definition of specific learning disability. Vincent C. Alfonso, PhD, is the Dean of School of Education at Gonzaga University. He is the past president of Division 16 (School Psychology) of the American Psychological Association, fellow of Divisions 16 and 5 of the APA, and a certified school psychologist and licensed psychologist. He has been providing psychoeducational services to individuals across the lifespan for more than 20 years. He is the co-editor with Dawn Flanagan of Essentials of Specific Learning Disability Identification, and co-author of Essentials of Cross-Battery Assessment, Third Edition. W. Joel Schneider, Ph.D.; Dawn P. Flanagan, Ph.D.; and Vincent C. Alfonso, Ph.D.
George McCloskey, Ph.D.; Jamie Slonim; Robert Whitaker, Psy.S. NCSP, ABSNP; Samantha Kaufman; Naoko Nagoshi, Ph.D.
Samuel O. Ortiz, Ph.D.; Kristan E. Melo, M.S. ; Meghan A. Opperman, B.A. Gail Cheramie, Ph.D.; Jamie Chaffin, Ed.D. ; Robert Lichtenstein, Ph.D.